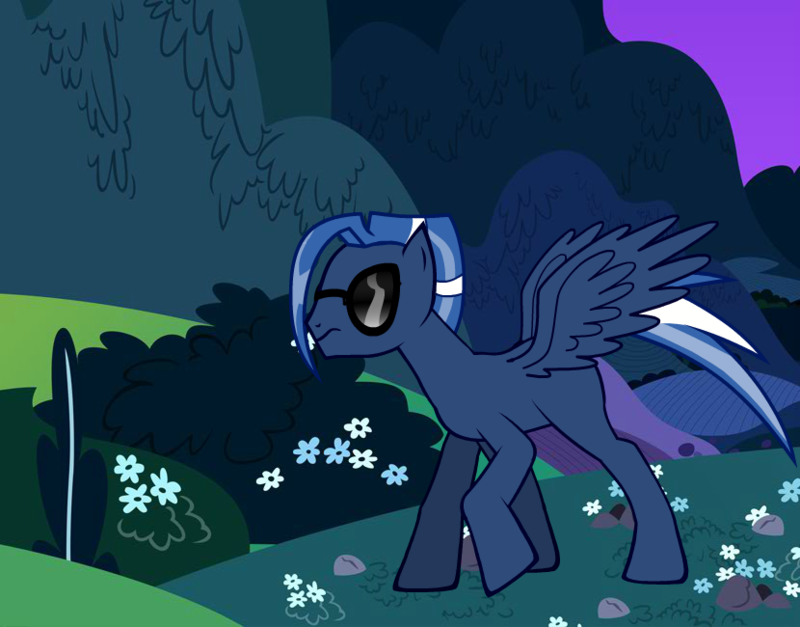 Midnight has a dark blue coat and his mane and tail are colored blue with white highlights. He has red eyes, but usually covers them with dark sunglasses for no apparent reason. He looks like an ordinary pegasus, but don't be fooled. He's not very stable, mentally, at times. Personality: Midnight has two persona, both on the opposite end of the moral compass. As Midnight Spirit, he is kind, understanding, always willing to help and stand up for others. When he feels the darkness growing inside of him however, he takes on the persona he calls Shadow Whisper, who is almost always rearing for a fight. He's aggressive, violent, and overall hostile. Because of this, Midnight usually changes his voice and wears a suit to cover his identity should his dark side do something his other half normally couldn't live with. He sometimes however let some parts of his personalities mix with the other, so don't be surprised if the kind and nice colt you think you know starts beating up somepony, or if the violent and destructive colt gives a flower to a filly and seemingly smile. Ponies from his past have said that he suffers from a condition known as split personalities, and that one personality is completely oblivious to the workings of the other. He didn't have the heart to tell them then that he was well aware of what he's been doing as Midnight Spirit, and as Shadow Whisper, and that he wasn't suffering from any mental disease. He simply wanted to live both lives. History: Midnight was different from everypony else. He was sometimes quiet and withdrawn, then suddenly turn into sunshine. Mood swings often made the other ponies uncomfortable around him. Only a few of them could live with him, but even they have their complaints. Midnight thought it was best to somehow find a way to control these switches, but no amount of therapy helped. It was then he decided to make two versions of himself. One was to be the all around good colt, and the other would be how he would let rouge emotions loose. There was a problem however. He needed the good half of him to be as far related to his dark half as possible. Thats when he decided to have a different identity. He made a suit designed from the Wonderbolts' pattern since they were idols to him. He changed the colors a bit to blend in better with the night, which is when he usually decides to be bad. After a few years of practice, he could now govern his two personalities and keep a balance between them. Since Ed, is gone fore a bit I will be reviewing this. I really like this character! He sounds like he would be great character in whatever rps you decide to put him in. Approved!